Face a large financial decision. Make the large financial decision. Many people start out life in the “real world” by making the large financial decision to go to college. And they use student loans to pay for it. Once the decision is made, they absorb the results make the necessary adjustments and live with them for awhile. Before they know it, they are back to #1 – pondering the idea of purchasing a home, having a child, starting a business, moving to another city, etc. Most of us want “guarantees” so we will know our financial decision will work out. However, at some points in life, we must make a decision without having all of the answers. We take the financial leap. How have you seen this process at work in your life? Have your financial leaps always worked out? If not, would you share some of the lessons you’ve learned from those moments with us in the comments? 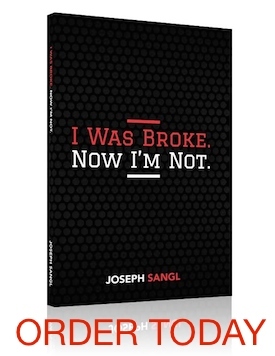 My book, I Was Broke. Now I’m Not., is focused on helping people win with their money. Check it out and grab your copy HERE.